Is this plant poison ivy? I was at the Colonial National Historical Park in Virginia, strolling along, and I noticed this vine draped all over the historical fence. As I was peering at it, a family walked by and the mother turned pale and gathered her children about her. “Stay away!” she said. “Poison ivy all over the place, you’d think the Park Rangers would do something about it.” And the kids cowered away from the plant and stayed obediently in the center of the blacktop path. Just another reason to stay inside and play video games. Now I’m afraid I get testy when I hear people pointing out perfectly harmless plants as poison ivy–I’ve heard people swear that a maple tree (with reddish leaves) or a raspberry bush or a geranium was a deadly plant to avoid. I’m convinced that one of the many reasons kids are so reluctant to go outdoors is that they think everything with a leaf is poison ivy. In this case, though, I can’t get all snitty because it fooled me, too. I have to humbly pardon the woman who called this plant poison ivy. It’s the best darn imitation I’ve ever seen. Three leaflets, reddish, shiny…you have to look very closely to see that on some of the stalks there are five leaflets, showing that this is actually Virginia creeper, a completely harmless plant. 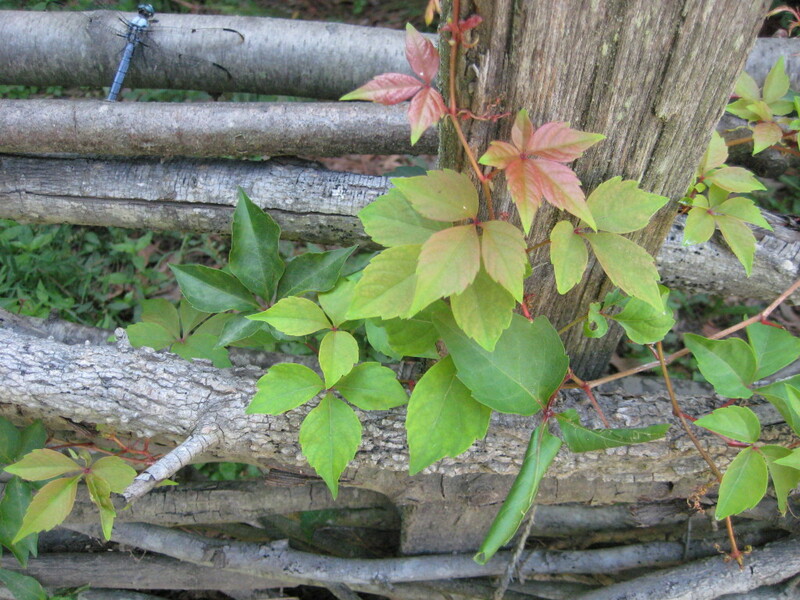 Young Virginia creeper leaves occasionally have three leaflets, and they tend to grow in the same place as PI. Another reminder to look closely and think twice before jumping to conclusions. P.S. Note the wildlife in the photo, which I hadn’t noticed till I posted it–dragonfly in upper corner, leaf roller at bottom–small caterpillar-like insect that rolls up leaves and lives inside the tube.